Home » #LadiesOfLondon » Bravo’s “Ladies Of London” Is Back For Season 2 With A Few Additions and Edits! 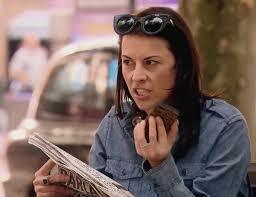 My Girl-Crush Caroline Stansbury Is Poised To Become The New Queen Of Bravo! Bravo’s “Ladies Of London” Is Back For Season 2 With A Few Additions and Edits! My Girl-Crush Caroline Stansbury Is Poised To Become The New Queen Of Bravo! Bless you Andy Cohen for giving me back my favorite #BravoTV Show “Ladies Of London” for a second season! I’ve been an avid “Housewives” watcher for years, but the shows are so scripted that there is very little reality in their version of “Reality Television.” I’m not saying that #LadiesOfLondon has more spontaneous moments to offer than it’s Bravo predecessors, but the women featured are far more cultured and interesting than the #RHONY, #RHOA, or #RHOC put together. Season 2 will feature changes to the core cast. Caprice Bourret is out, instead she’s focusing on raising her baby boys and managing her intimates business. (She and Caroline quit speaking during S1) Noelle Reno, who heavily featured with fiance Scott Young through the entire first season, faced tragedy when Young committed suicide after a fight with Reno.There is no word if Reno will appear in S2 in a limited capacity, but she is featured in recent “Ladies Of London” videos on Bravo.com. So who’s in the new cast? I’d ask Caroline Stanbury, because at least one new “Ladies Of London” is family! That’s right! 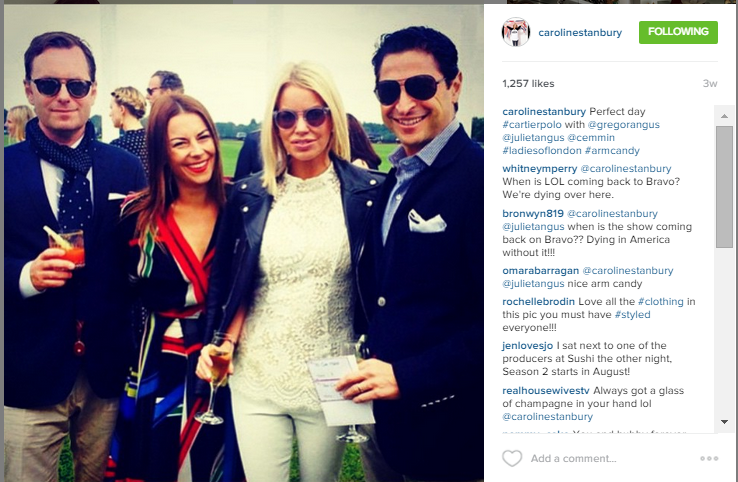 Caroline’s own sister-in-law Sophie Stanbury is on board, as is “Top Model” judge and Stanbury bestie Caroline Fleming. Rounding out the remaining cast are returning members Juliet (Brandi) Angus, Marissa Hermer, Lady Sandwich Julie Montagu, and Annabelle Neilson, who has recovered from her horrific horseback riding accident and is back to being fabulous! Follow all the Ladies on Instagram to see where they have been shooting! 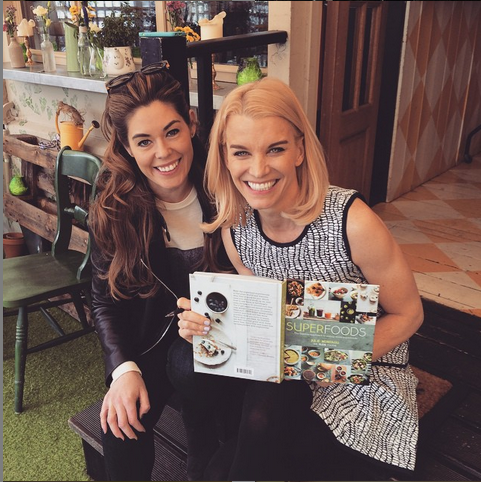 A cast trip to Denmark featured in S2, and Julie Montagu’s “Flexible Foodie” book signing pictured below. “Ladies Of London” returns to @BravoTV on September 7th. 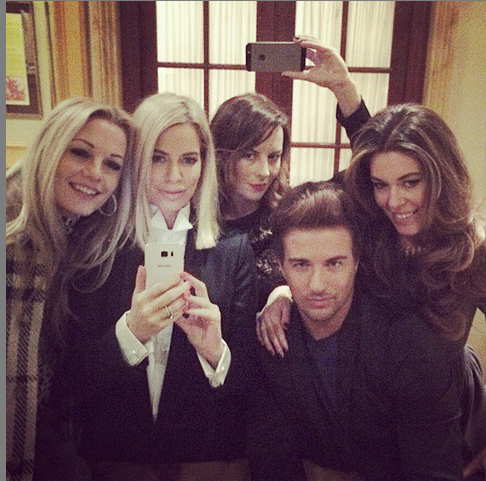 6 Comments on Bravo’s “Ladies Of London” Is Back For Season 2 With A Few Additions and Edits! My Girl-Crush Caroline Stansbury Is Poised To Become The New Queen Of Bravo! So excited!!! Also glad that Caprice is gone. I hated that poser. Caprice is such a tool! I love this show! Wish they didn’t have to cast a “stupid American” like Juliet. She makes us look like vile idiots. I know she’s scripted to the hilt but gimmee a break! I like Juliet. Glad Caprice isn’t returning. Sad about Noel Reno’s fiancé I hope she returns too. I’ve see Noelle in recent photos with Caroline Stansbury and in a few Bravo promo videos, but not on cast trip to Denmark. Maybe she will be part-time?